Aahh, tribute albums…now there is a subject tailor made to spark the odd controversy or three. I confess, I own dozens of the damn things; some because the band being paid tribute to is special to me, and some because of favoured musicians featured paying tribute to bands I’m not that bothered about. In the digital age, these things have become more common because the backing can be laid down and then emailed across the world for the guest vocalist/guitarist etc. to record their parts. This means I have some decent stuff that bears the odd listen and compliments the original; it also means that I have some shockingly bad stuff that I wouldn’t even give Mp3 player room…not naming names, but the NYC tribute CD I have is there only to complete a collection and will never be played again…equally the Working Man tribute is sheer class and does pay due homage in a unique way. This is not a totally new fad…I also own Funky Junction play tribute to Deep Purple, which came out in 1973 and was later revealed to be an early incarnation of Thin Lizzy with help from members of another Irish Band, Elmer Fudd. Suffice it to say that, when I do listen to my original vinyl copy, I only listen to the brilliant instrumentals that they used to fill the gaps between Purple covers. Listen to Eric Bell on Dan, Palamatoon, Rising Sun and Corina and you will be amazed. 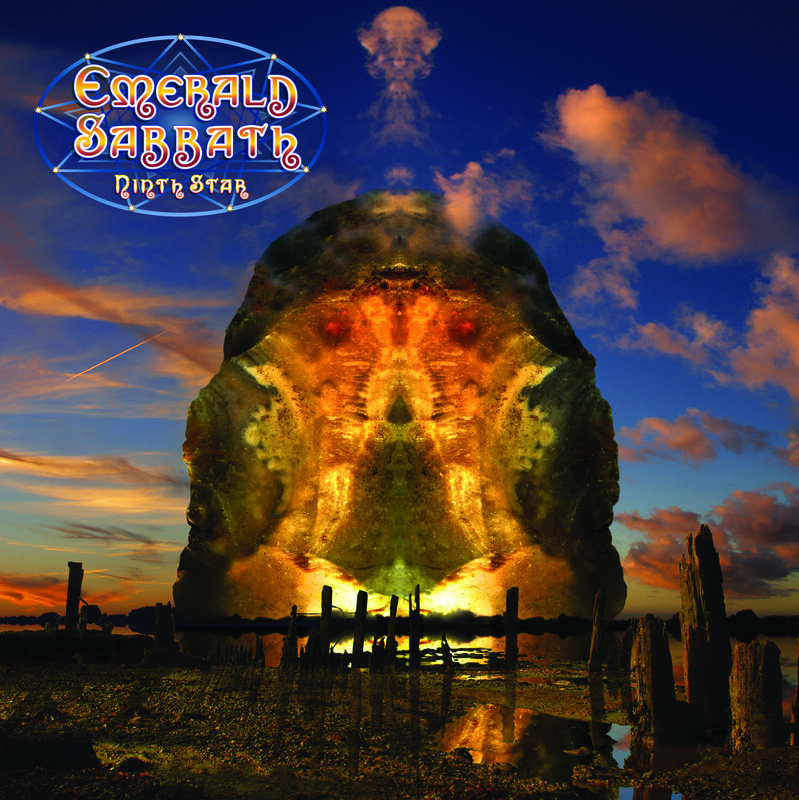 Anyway, this is supposed to be about a particular new Black Sabbath tribute album that, coincidentally, also began life on the Emerald Isle, hence the name, Emerald Sabbath. Playing on the name of the Seventh Star album of years ago it is called Ninth Star and boasts an orchestra as well as a rock band…not that orchestral tributes are new either…I own a mediocre CD by a Moscow based orchestra and orchestral Queen tributes did rather well a while back. This recording is the result of a lifelong devotion to all things Sabbath by Irishman Michael Suilleabhain Bundade, from Castletownbere in West Cork who somehow managed to get a load of previous Sabbath members together to record a diverse mix of Sabbath across the year’s tracks. Some of them you may not be that familiar with …for example, Dave Walker (who I knew only from his time in Savoy Brown) was a member in ‘77/’78 and performed live with the band once. Anyway, the full list of performers is below, if you’d like to peruse the contributors and the diverse track choices: no obvious ones for Mr. Suillebhain which does add to the appeal. On to the music, and The Ninth Star opens with Embryo (the instrumental introduction to Children of The Grave from Masters of Reality). Lasting under a minute, it doesn’t deviate much from the original and is pleasant enough. Die Young is next which on Heaven and Hell and features Ron Keel on vocals. Now, the late, great Ronnie James Dio cannot be copied or bettered and Keel tries very hard but I’m afraid it just grates on me and, as the instrumentation is almost a straight copy, I will not be listening to this one again. Next is Fluff, the instrumental piece from Sabbath Bloody Sabbath and here it is transposed for strings, flute and clarinet. This is where this idea works best as we don’t have ill-fitting vocals or a note for note copy, just a real re-interpretation and, as a consequence, this gentle, orchestral lullaby is a pleasurable oasis in this mad world. Stonehenge, from the vastly underrated Born Again, turns into a proggy tinged track with the flute cascading over the guitar and actually adding atmosphere to the heartbeat of the original. Trashed, from Born Again again, is another straight rock band format with Keel attempting the impossible by replacing Ian Gillan this time…this was heavy as hell pounding rock and here is, to my ears, a bit lighter and therefore weaker. Keel makes a decent fist of the vocals, but again I will stick to the original. She’s Gone, the ballad from Technical Ecstasy…here, rather than the Ozzy in pain sound, we have the soft yet raw tones of Dave Walker and a flamenco style guitar. The result is a decent interpretation that, like the original, is flawed at best. If you forget the original, then this is a very nice piece of soft rock with the backing vocals and strings making it relaxing despite the sadness in the lyrics. In For The Kill from Seventh Star, had Glenn Hughes histrionics and the whole album was regarded as not Sabbath but, like the DEP Sessions and Fused, an Iommi solo with Hughes. On this track the underappreciated Tony Martin does a good (better?) job vocally against the rock band backing…it is, otherwise, a pretty faithful rejig, with the guitar solo taking the essence and doing a damn good job. The second Masters of Reality instrumental, Orchid, is next and as with Fluff it is a neat orchestral version that works well. Sabotage is the next source album as we get a band/string interpretation of Hole In The Sky with Keel sounding aat his best here. Overall, though, it is another I will go to the original first. Next we get the Vol 4 ballad, Changes. The original was different and powerful before it was forever tainted by the father/daughter version. Here Michael takes the vocals and, for a nuclear power engineer, does a reasonably good job. Instrumentally, it actually benefits from the violin and woodwind. The Queenie May vocals are suited well and it would have been better, in my mind if she had done the lot. The best Sabbath instrumental in my humble is Supertzar and the addition of harp, glockenspiel and an almost operatic Choir doing some timely oohs and aahs, it actually becomes the best track on this album and projects the same sense of majesty as the original, but with added quirks…such as the baroque outro. So…if you like tribute albums, then this is as good as most and better than a lot. For me, it will only get the occasional, selective outing, as there are too many “doesn’t sound right” tracks for me to cope with. That is the problem with tributes, as opposed to cover versions…I don’t mind a cover in amongst originals; I don’t mind truly interpretative albums like Gary Moore’s ‘Blues For Greeny’ or Bernie Marsden’s ‘Bernie Plays Rory’ but, whilst this is immaculately conceived and executed, it just doesn’t do it for me…sorry!